The K-State sports marketing class, MKTG 630, hosted an eSports day on April 12, 2018 at the College of Business Administration, which included two members of the National Association of Collegiate eSports, or NACE. Shirley and Matt Thompson, a member of the board of directors at the association, spoke about the growing industry of eSports in collegiate athletics. The association acts as the only association of varsity eSports programs at colleges and universities across the United States, while it lays the groundwork for collegiate eSports players to receive scholarships. Shirley is hopeful that the students will be receptive to eSports culture becoming the norm in the future. The industry of eSports, professional and collegiate, has skyrocketed in recent years with the developments of eSports streams like Twitch.tv. In 2017, the professional eSports industry managed 335 million viewers, capping off $655 million in revenue. Collegiate eSports has grown in recent years to being a varsity program at more than 70 institutions across the country. K-State’s sports marketing class hosted the event in three parts. The morning began with the K-State eSports club demonstrating play of top games, including gameplay of League of Legends and Rocket League. In 2017, League of Legends generated $2.1 billion, while Rocket League topped $110 million, according to statista.com and gameindustry.biz. Following the demonstration, the K-State’s sports marketing class hosted the five panelists involved in the industry during its class session. 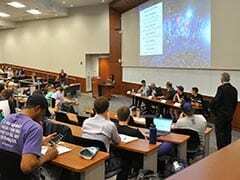 Shirley, Thompson, Kevin McCarty, director of digital media at K-State Athletics, and the current and former presidents of the K-State eSports club, Sam Smith and Cody Baldwin, were asked questions and presented about their involvement with eSports. According to McCarty, K-State Athletics is not in a position to open its doors to a varsity-level eSports program, which would require the department to provide scholarships and a facility to manage a collegiate eSports team. “We are getting to know the eSports club at K-State and learn all we can from folks at NACE,” McCarty said. McCarty said that Gene Taylor, director of K-State Athletics, asked McCarty to pursue more fact-finding and to gather more information about the future of the industry. Since the fall of 2017, McCarty has been to two eSports conferences across the country and been in contact with other schools. McCarty expressed one of the main challenges with K-State Athletics pursuing a varsity eSports team is the violence in the top games, including Counterstrike. The day finished with a press conference with the panel members, which can be found on the K-State Sports Marketing class’ Facebook page.